Come on, it’s Friday, and you know that you read tech blogs so you can dream about technology like this. This Gyre (that’s what it’s called, but I don’t know how to pronounce it) is one of those concept drawings that will probably never be made into reality. 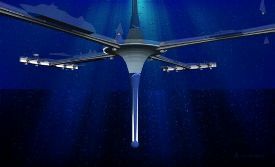 But if the world really is getting as overpopulated at some people are saying, then we will have to live in the ocean. After all, the Earth is seventy percent water, and we’re only living on the thirty percent. This floating city will have just about everything including shops, hotels, restaurants, and other recreation areas. Gyre has the space equivalent of 40 football fields, and can support two thousand inhabitants. Of course, someone will have to power all of these things, right? The plan is to use a combination of solar power, mixed with tidal and wind. Rainwater will have to be collected for water, but I’m not certain what the source of food will be. I wonder what it would be like to live in this city? Well, I suppose that one day we will find out if the ice caps melt and we have to live out in the ocean like in Waterworld. Gyre certainly looks better than any city from that Costner flick.